This is the question John Wight asks of journalist Graham Phillips as they discuss his upcoming documentary 'A Brit in Crimea'; which aims to dispel the myths about this Black Sea peninsula and to get to the truth about life in the region three years after it voted to join the Russian Federation. The Ukrainian Svoboda Party is holding a protest rally opposite the country's Ministry of Justice over a proposal to host some of the Syrian refugees attempting to resettle in Europe, Ukrainian media reported. 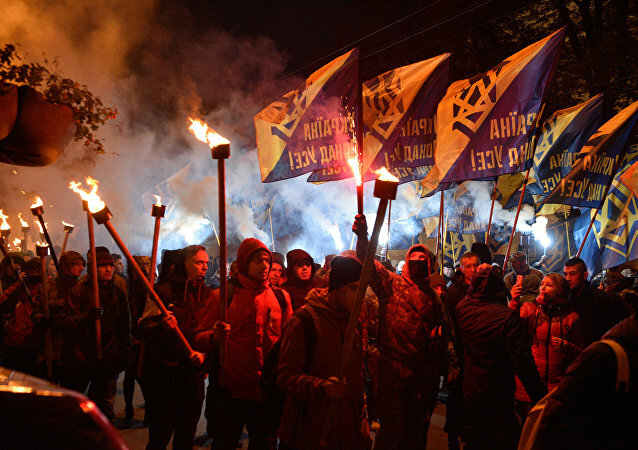 On Friday, several thousand Ukrainian ultranationalists descended onto the streets of Kiev to mark Ukrainian Insurgent Army (UPA) day, dedicated to the 74th anniversary of the founding of the WWII-era Nazi collaborationist organization. 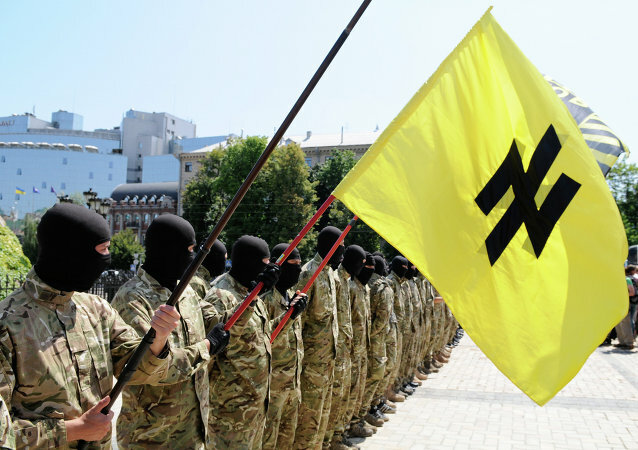 US media coverage of the neo-Nazi Azov Battalion in Ukraine has diverted attention from the fascism that permeates politics in Kiev, experts told Sputnik. Hundreds of people, mostly from the Ukrainian Nationalist “Svoboda” party, have taken to the country’s parliament on Tuesday to rally against corruption, demanding the set-up of a temporary parliamentarian investigative commission to investigate corruption in parliament and the temporary resignation of the Prime Minister for the period of inquiry. The six parliament members listed as initiators of the bill are not part of any parliament faction, but are members of the nationalist All-Ukrainian Union Svoboda Party. Ukrainian parliament members from the All-Ukrainian Union Svoboda introduced a new bill on Monday on “terminating the agreement of establishing the Commonwealth of Independent States (CIS)”, a statement on the Verkhovna Rada official website said. Ukraine’s Svoboda and UDAR parties announced Thursday their factions in the Ukrainian parliament were quitting the majority coalition, paving the way for the dissolution of parliament. Police in Ukraine said Thursday that have opened a criminal case over an alleged incident of public disturbance during a nationalist procession in the capital, Kiev, earlier this week. Ukrainian nationalists on Monday submitted to parliament a ban on communist ideology in the country, one of the bill’s authors said.